The Rukka Roughroad Pants are our first taste of true Adventure gear from Rukka in the States and we couldn't be happier to get our hands on them. Rukka has stood at the top of the mountain in terms of build quality, next level materials and bomb-proof wearability for years and these join their sport touring counterparts on that apex. 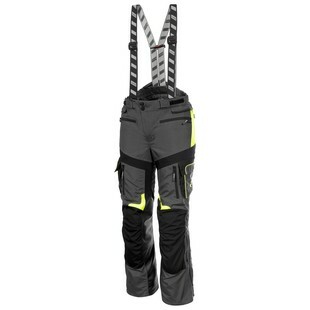 The Roughroad pants add the elements we like to see on Adventure gear, such as thigh vents, cargo pockets, reinforcement in impact and abrasion zones, but also some hidden gems such as the AirCushion System on the seat area, which reduces condensation and acts as a climate buffer. The waterproofing comes from a removable Gore-Tex liner, allowing you to pullout the extra layer for spirited rough rides and install it when the weather turns for the worse. All in all, we are ready to get rough with the Roughroad Pants and have every confidence that they will stand up to the harshest conditions.